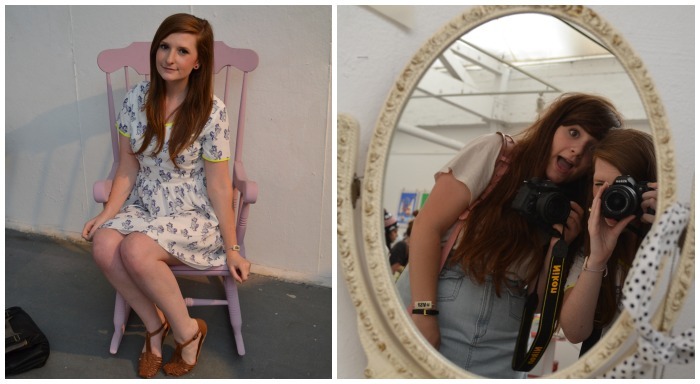 A couple of weeks ago I headed back to Birmingham for The Vintage Set Festival, a blogger meet up held at The Custard Factory. It was a really fun evening held in an empty art exhibition type space, with loads of stands from local shops and businesses plus some from a little further away too. One of the businesses that stood out to me was Nails By Rosie, an amazing nail artist based in The Custard Factory who had a small desk at the event and was offering a free accent nail. The queue was really long and I was constantly being distracted by talking to people so didn't get one done, but Kim had the cute sunflower nail above! Rosie is constantly putting pictures up on her Instagram, so I recommend you follow her here. It was so lovely to meet Faye from jewellery brand, The Bohemian Collective and also Sophie from Pretty Little Poppet - both are ladies behind online shops which stock their own handmade pieces, which I really admire! I also met and caught up with so many bloggers. There's the oldies who I've met before like Katy and Steph, then some new ladies like Jess, Sophie, Emma, Meg, Claire and of course Lily!